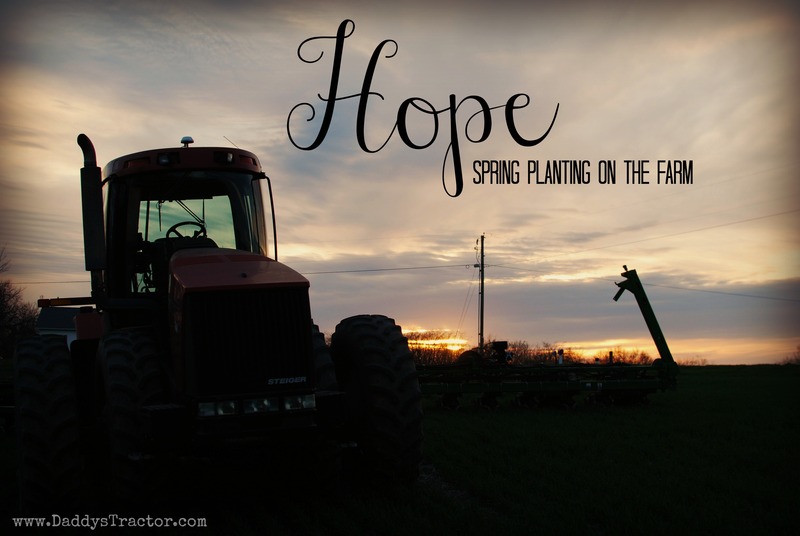 For a farmer, spring is hope. 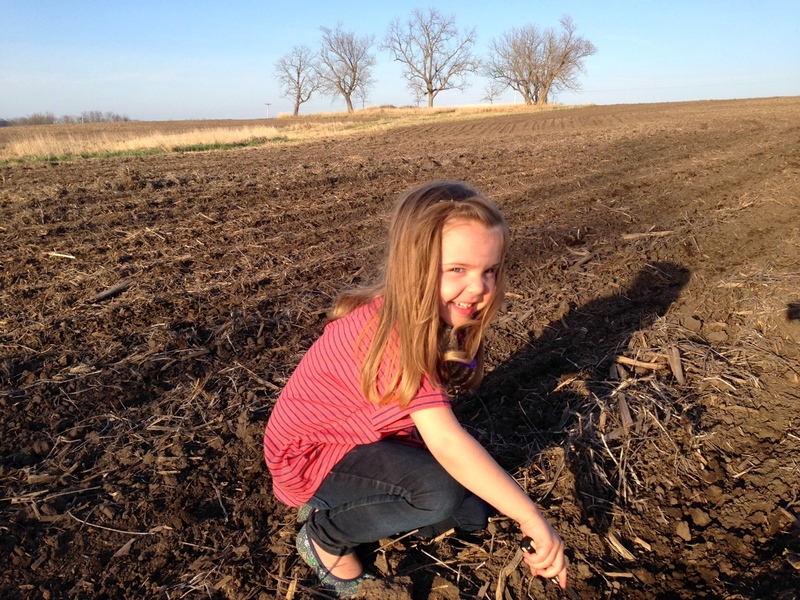 No matter how poorly last year’s crop grew, despite the prices at the grain elevator, and against the odds of droughts, hail, insects, flood, and other calamities, we put seeds in the ground. 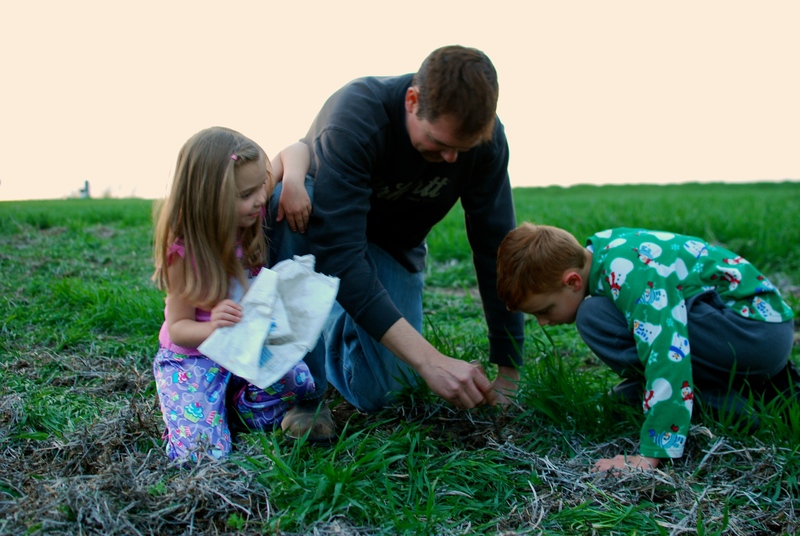 Last week Daddy showed up in the field that is our front yard (at bedtime, please ignore the pajama-clad kids) to plant the first test rows. 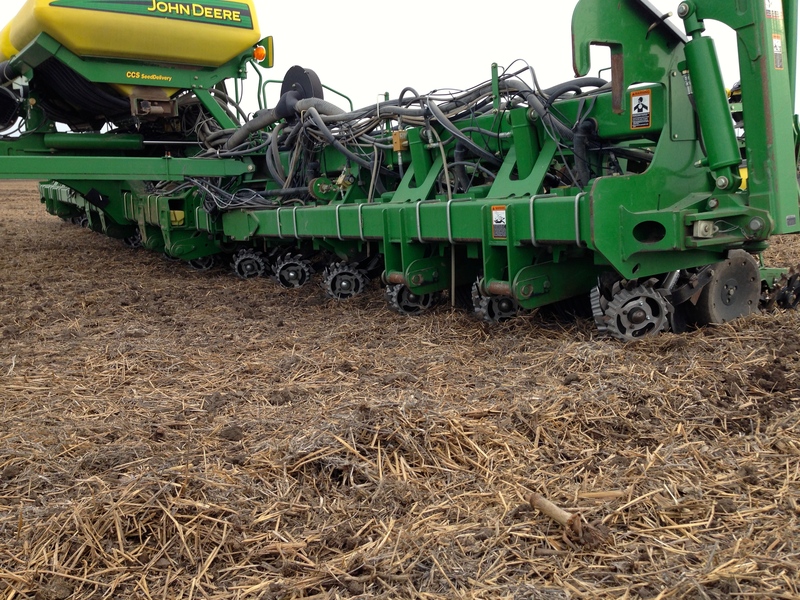 He drove the tractor a few yards into the field and stopped to see how the planter was working. Daddy looks in the rows created by the planter to see how deep the seeds are, how close together they fell into the ground, if there are spaces where the planter skipped seeds or dropped a double. 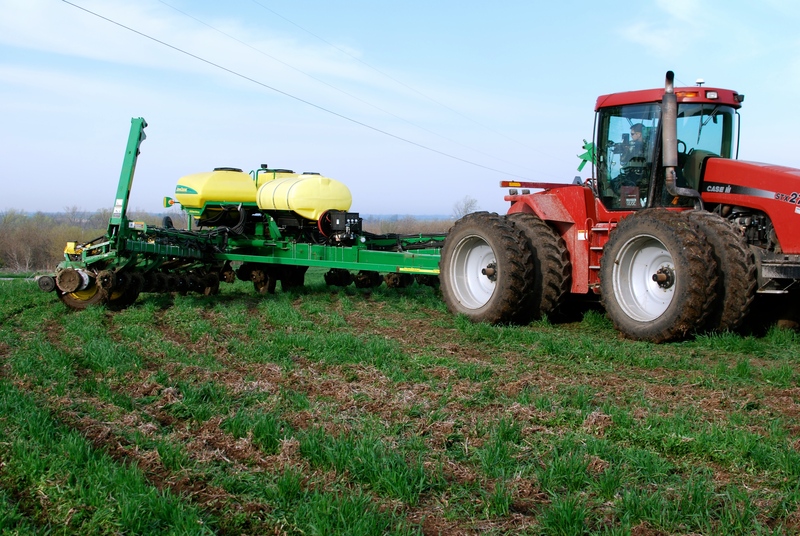 Daddy has invested equipment from a company called Precision Planting that creates add-ons for your tractor and planter to ensure that every seed is placed as precisely as possible. 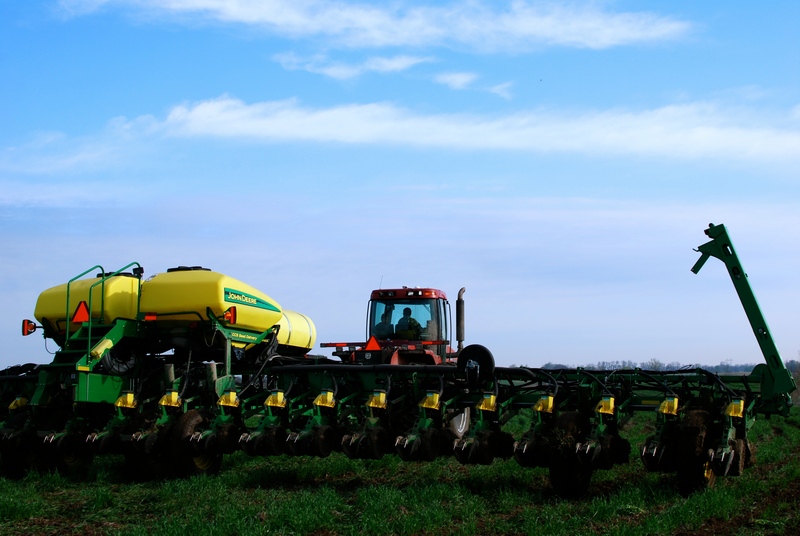 For crops like corn, that can make an impact. He’s also checking to see if the wheels on the back of the planter are doing a good job covering the seeds back up with soil. If you look carefully at the above photo you’ll notice one round, black wheel paired with one spiky looking one. 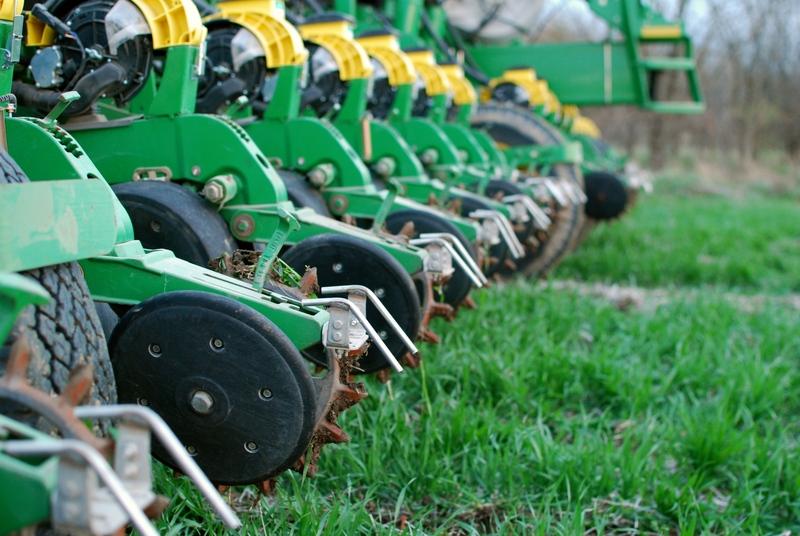 The ground was too wet to use the spiky wheels, so Daddy had to take the planter back to the shed and changed each spike wheel to a matching black one. 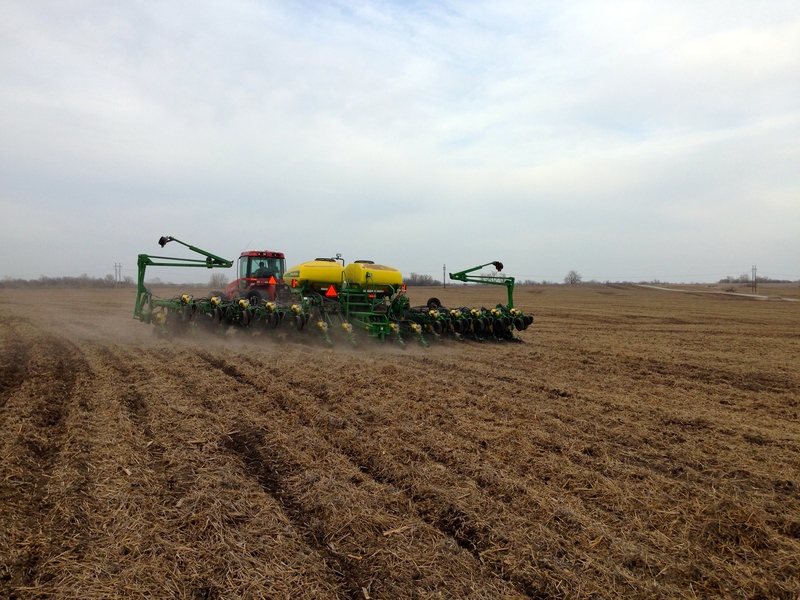 When he came back the next morning I was able to grab a few pics of him unfolding the planter. 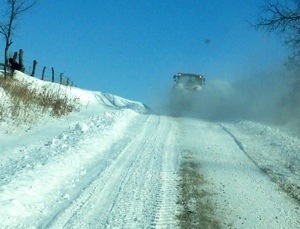 This piece of machinery is 60 feet wide and couldn’t possibly get down the road like that! 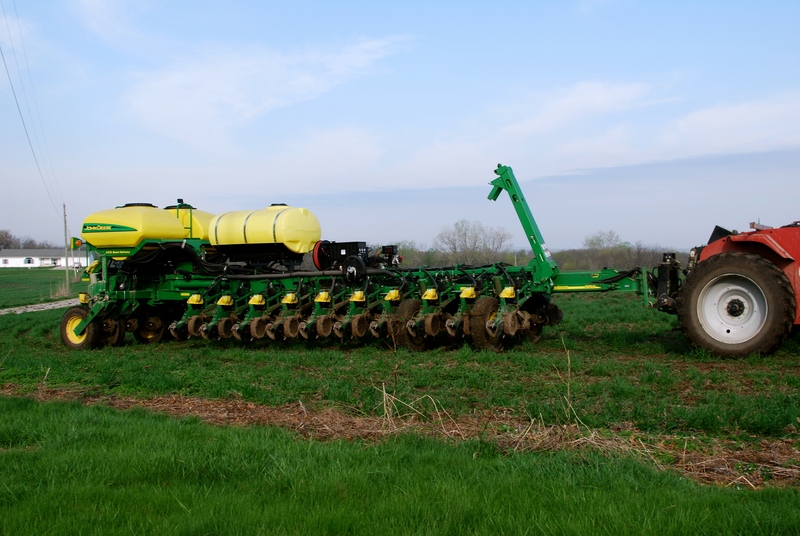 This planter folds in three places, with the two side sections bending forward to align next to the bar that pulls it behind the tractor. 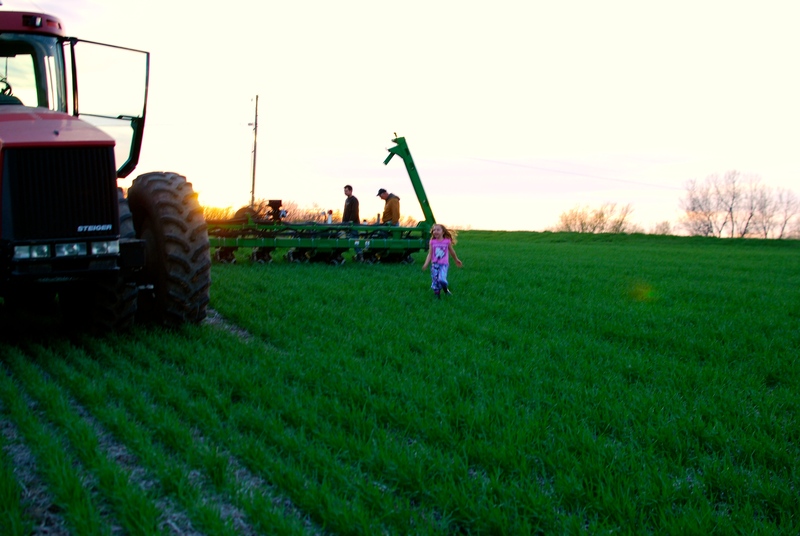 The sections swing out and the bar that pulls behind the tractor actually shortens to give more control while Daddy is driving. 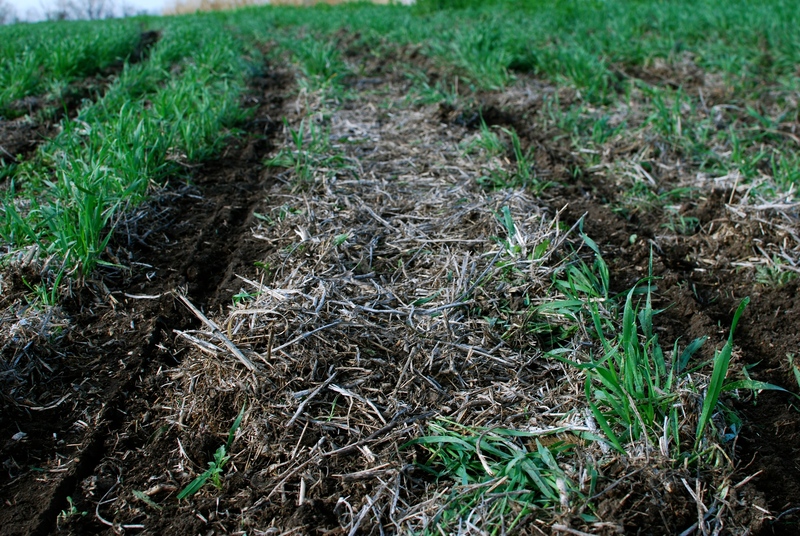 When the sections lock into place its ready, planting more hope in the ground as it goes. Last spring I ordered meat chickens, thinking that filling my freezer with delicious, home-grown chicken would be a fulfilling and useful endeavor. We’d planned for a while to get a fridge for the basement for the extra eggs (they can be stored forever) and then the freezer could host the meat chickens when the time came. Expect the time came long before we actually purchased the fridge, so the huge birds have been eating us out of house and home, literally going through a bag of feed in three days. But the fridge finally is in place and now all I had to do was butcher 22 roosters. Brian came home early to help, since wrangling 3 kids and a large knife is not a safe practice. I am very, very grateful for his help, since he ended up killing more than half of the birds while I plucked. And plucked. And plucked. And plucked. Until almost midnight. I did everything you’re supposed to do. I dipped the birds in hot (not boiling) water to loosen the feathers. I started with the wing tips since they are the hardest. I tried not to cry when it got dark and I still had a pile of birds at my feet. To add to the disaster I will add that I also lost the photos of the event I took for the blog. That would be more upsetting in and of itself expect that I lost the photos because I’ve lost my fancy DSLR camera. And even that is put in perspective because I took off my wedding ring to butcher the horrible creatures and it, too, is missing. I should also clarify that we only butchered 12 of the birds. Which, I suppose, gives me a second chance at taking photos. If I find my camera. Oh My Goodness, It’s Working! I’m so excited! Knock on wood, so far my newest experiment in backyard farming is WORKING! If you follow me on Instagram (and you should, @daddystractor) you’ll already know we received an unusual-looking package in the mail yesterday containing baby chicks! 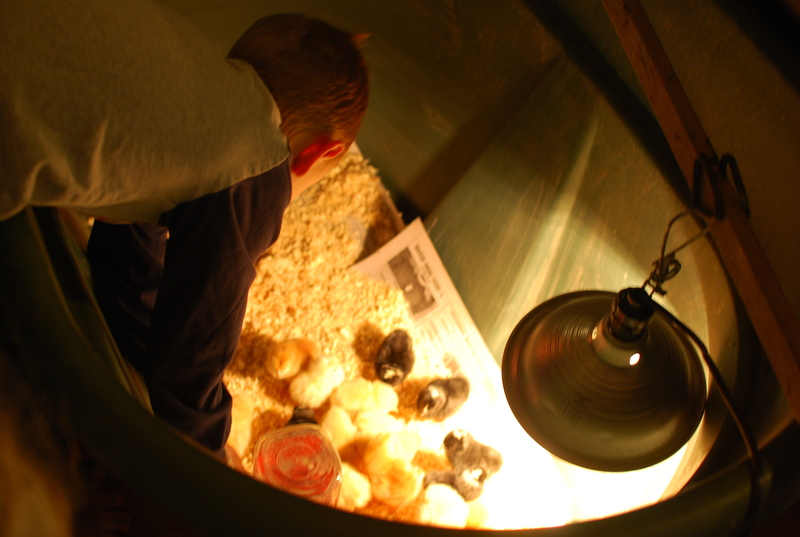 When they arrived we took them downstairs to the brooder and settled them all in with drinks of water and some chick feed. They come in the mail– how crazy is that! We use this cattle feeder as a brooder. It works for the first few weeks anyway! 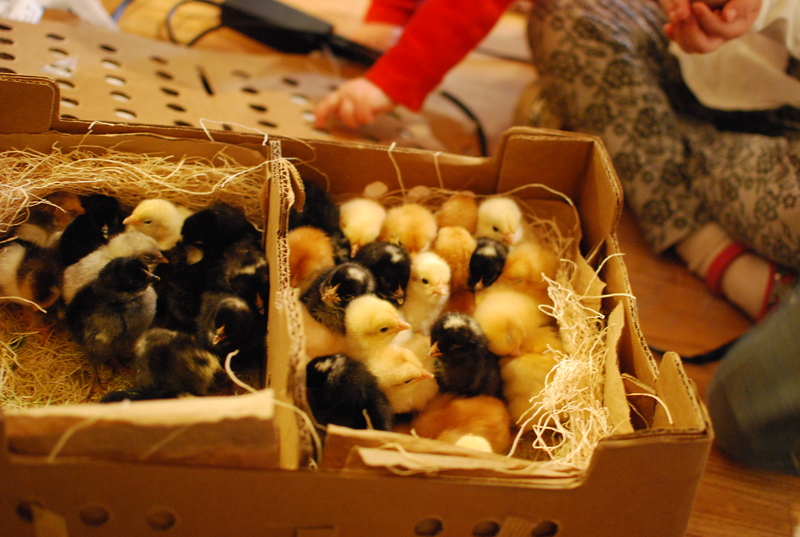 We ordered 40 chicks this time around. 25 are “pan-fry” chickens I plan to raise to feed my family. 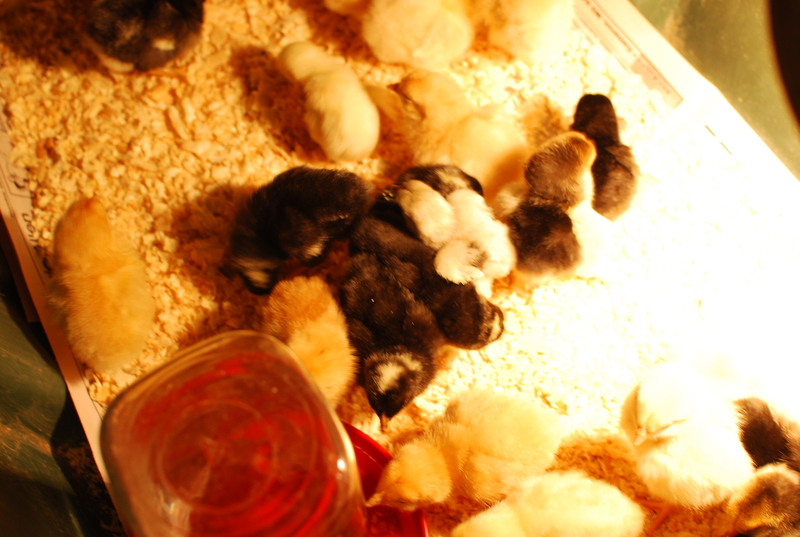 The other 15 are assorted bantams, destined to be pets for the kiddos. I said yes to this idea because if you think baby chicks are adorable, well, you have to see a bantam chick. They are a third the size of a regular chick. Need I say more? They are all so cute, but why is it tiny things are even cuter!! Really they are just here to eat expensive food and take up time and energy. So I came up with a plan to cut down on the time and energy, if not food. 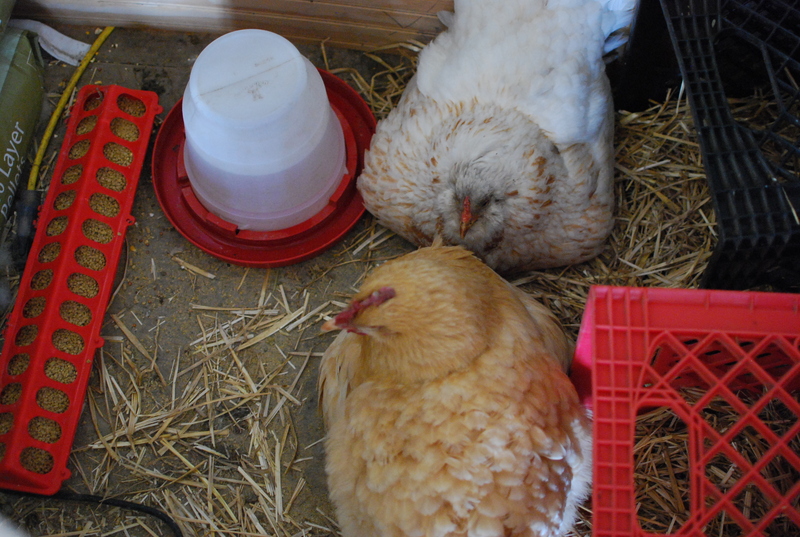 Two of my laying hens have gone “broody.” This means they keep setting on eggs, trying to hatch chicks. Broody hens aren’t great on a farm because they tend to be more likely to peck and they stop laying new eggs in their attempt to hatch the ones they’re sitting on. Conventional wisdom is to keep a broody hen away from the nesting boxes until she gives up on the idea, OR… get her some chicks to raise! An experienced mama hen is a pretty amazing animal. She will sit on her eggs for 21 straight days, getting up just once a day to eat and drink for a few minutes. However, my hens are not experienced mamas. Actually… they’re not all that bright either. I gave a mama hen some eggs to see if she could hatch her own (how fun would that be?!) and she couldn’t keep track of which box was hers. She’s been sitting on different eggs for almost 4 weeks. The nesting boxes are a busy place! Which makes my plan of putting bantams under these two chickens unreliable at best. Last night Brett and I slipped the banties under the two hens–you can handle chickens more easily after they’ve gone to bed. This morning I got up early to be out there just after the sun popped up and both mamas were sitting on 15 very quiet chicks. I created a separate space for the new families in the part of the coop designed for storage, giving each mama a milk crate and straw nest on the floor. 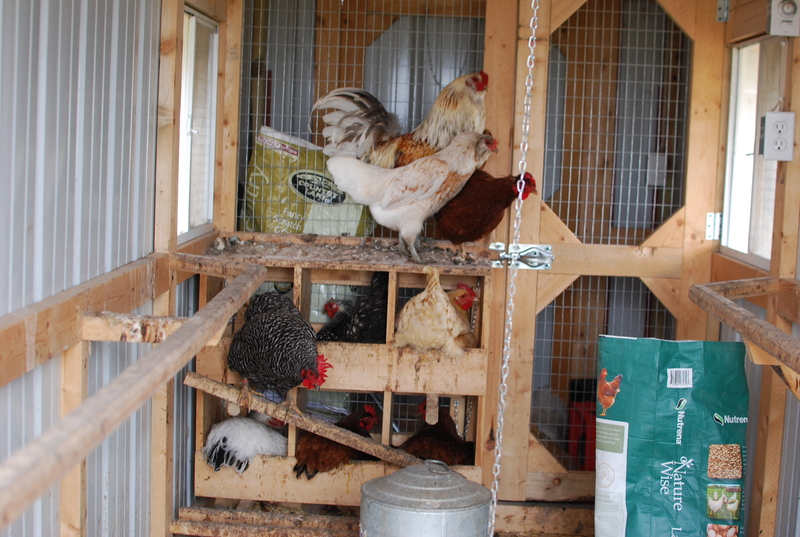 (The nesting boxes are on the wall and the babies won’t be able to get in and out to get to food or water.) I was really nervous about having to move everyone so soon after the introductions, but oh my goodness, it’s working! As soon as they saw the chicks in the new nests both mamas moved right in and took charge of their little broods. So far, so good! Yay!! 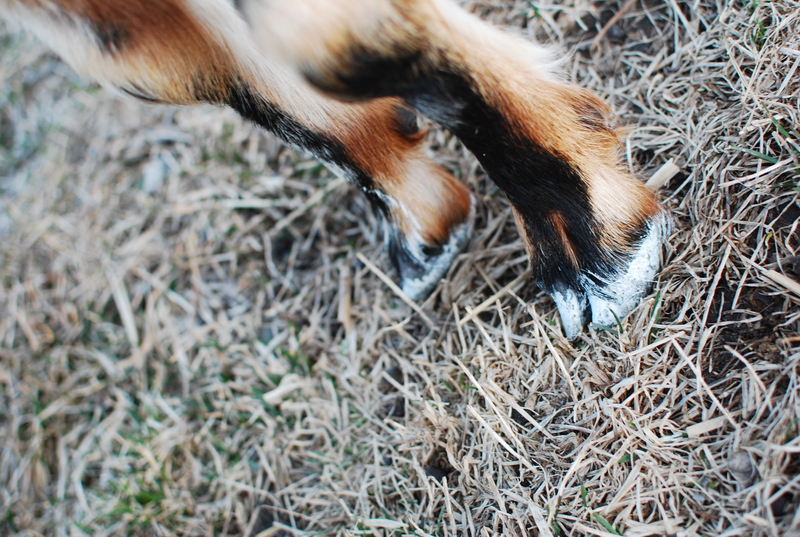 My goat is currently styling the latest in white painted hooves and my lamb is showing off a french manicure. I’d like to tell you it’s because I follow all the current fashions, or maybe because I’m using some great home remedy to protect against disease or something. 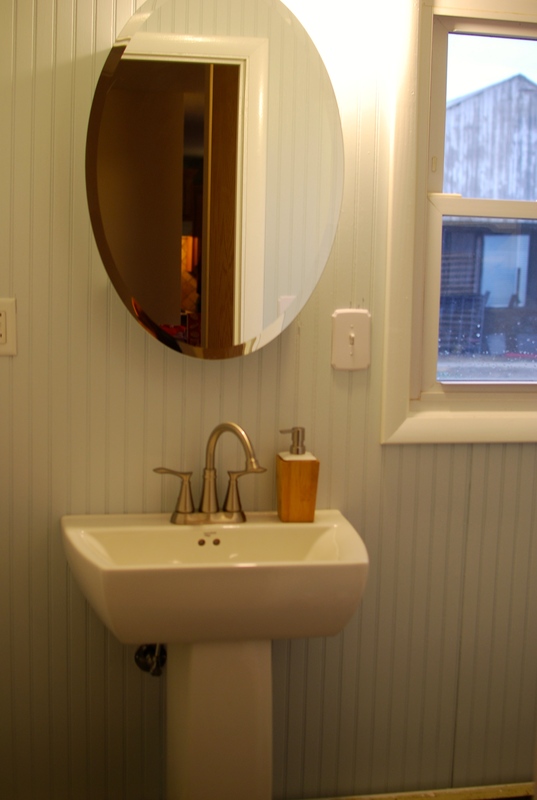 But actually it all has to do with the black mold in the bathroom. This color really goes with her outfit. Our back bathroom has been disintegrating since the mid 60s, so the surprise was from the shock of actually falling when the shower tiles I was leaning against collapsed into the wall. This led to the discovery of black mold behind the tiles and the complete destruction of that bathroom. After much sanding, scrubbing, and bleaching we began replacing everything from the wall studs on out. We put in a new shower, flooring and tile, added wiring for more outlets, and put up bead board. We picked bead board that needed painting. Yup, wait for it, it’s coming. On one of the rare, few days that has felt like spring my mom and sister came over to fly kites with the kids. There was lots of going in and out of the doors with Fanny, Harriet, and Lizzie leaping for joy to have company in the yard. My mom and I were talking in the front yard when Brett came bursting out of the house to tell us all three animals were inside! Don’t let that innocent face fool you. 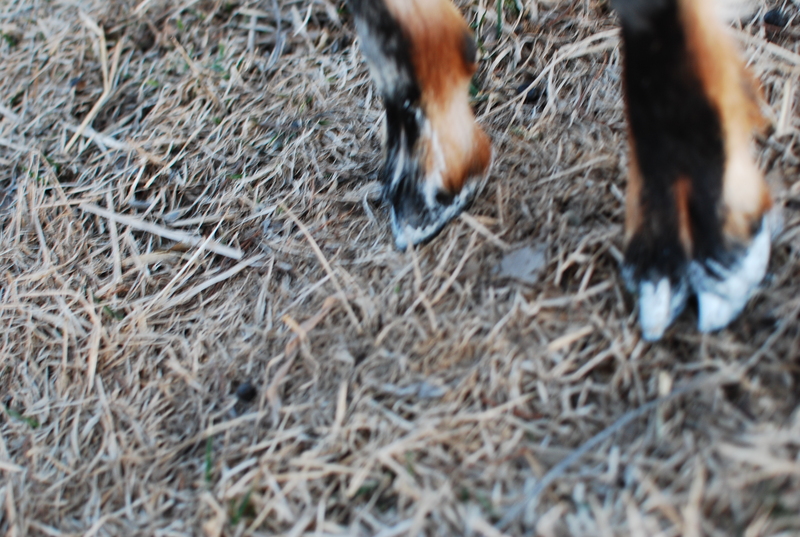 We followed Brett through wide open garage and back entry doors, to find Lizzie the lamb standing on my newly tiled bathroom floor, front hooves in the still-wet paint tray. Of course as soon as she saw me Lizzie jumped up from her half-finished spa day, scattering newspaper in all directions. 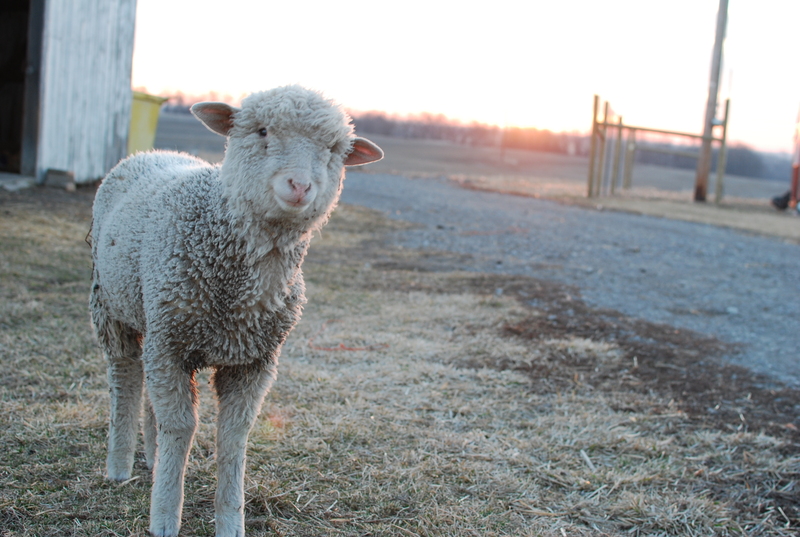 I managed to get ahold of her collar, but this “little” lamb weighs close to what I do. The best I can do is to pull her as quickly as I can off the back entry and out into the garage and slam the door behind her. 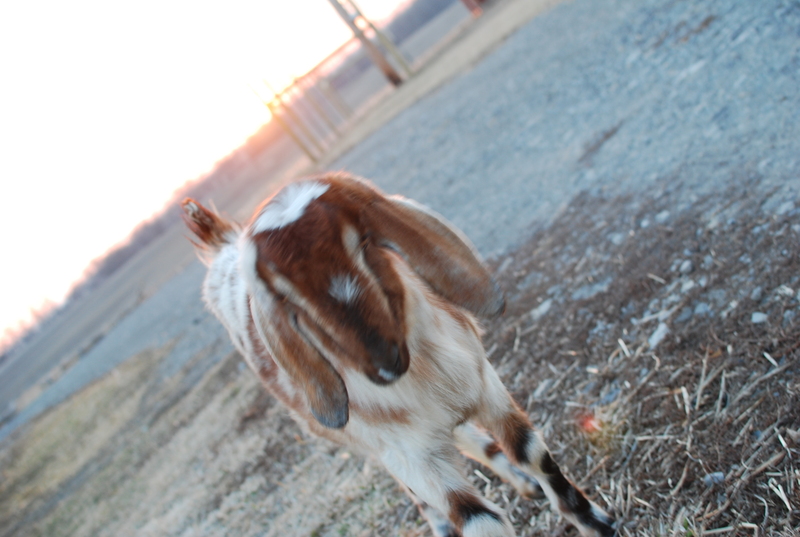 The goats were nowhere in sight, but I finally discovered them at the other end of the house by the bedrooms. They, too, were rather skittish so it didn’t take much to convince them to move. Moving in the right direction was a different story. First we ran the circle that is the office and living room. Next mom and I had to take opposite sides of the island to get them back to the entryway, and then, if you can believe it, we hearded them right into the closed back door and on into the bathroom! 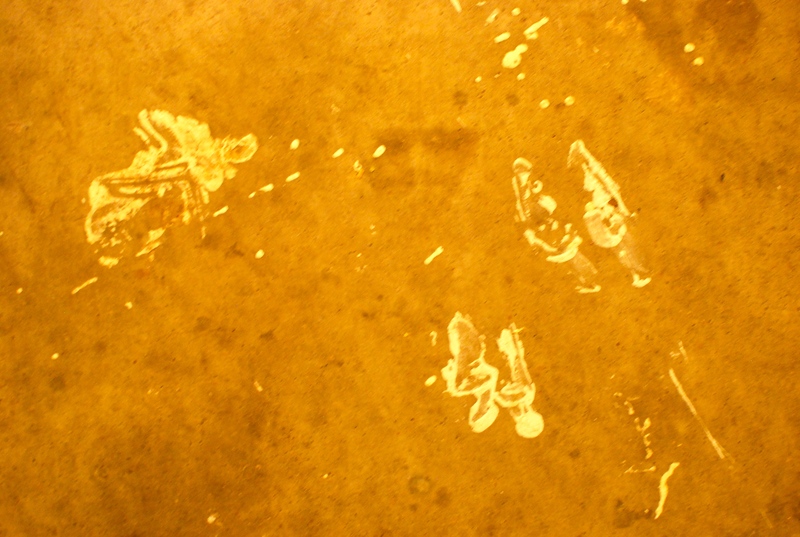 Fanny managed to avoid the paint tray but Harriet not only stepped both front feet into the deepest part, she also skidded enough to slosh paint all the way up her hooves, completely covering both of them in primer. Thankfully Harriet is smallest of the three animals and I was able to pick up her front end and walk her to the re-opened back door and deposit her in the garage before running for a rag. Fortunatly, all’s well that ends well and the back bathroom as well as the animals are all fine. But the garage will never be the same again. I didn’t grow up a farm girl. Not even close. So I’m kind of making the whole farm life thing up as I go along. Like the goats I brought home a month ago. 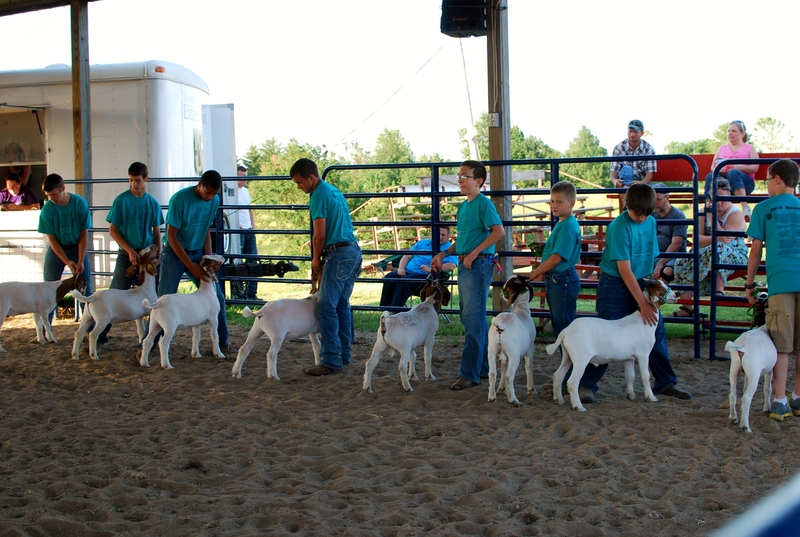 One of my goals was to get Brett involved in 4-H so he could show the goats and maybe some sheep. Little details– I didn’t even know how old you had to be to join 4-H. But what better way to find out than just to show up at the county 4-H livestock fair and question poor, unsuspecting participants! We walked around and looked interested and sure enough, several families stopped to talk with us. 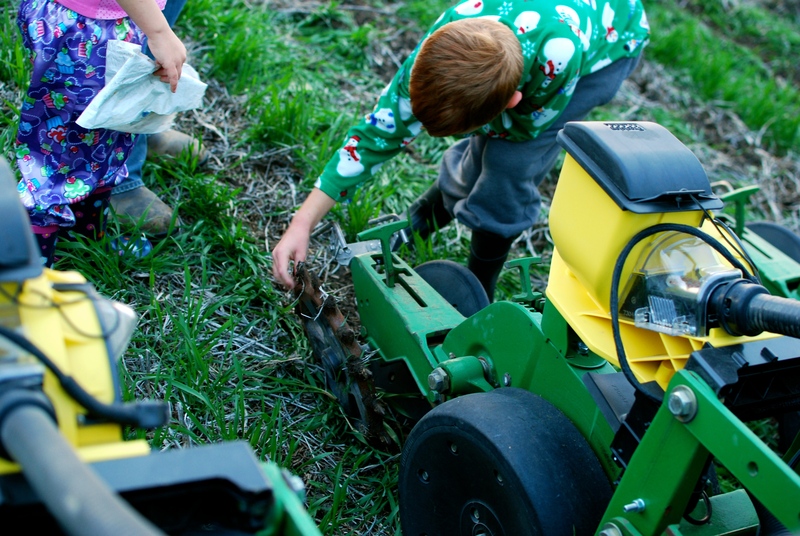 (Love this about farm families!) 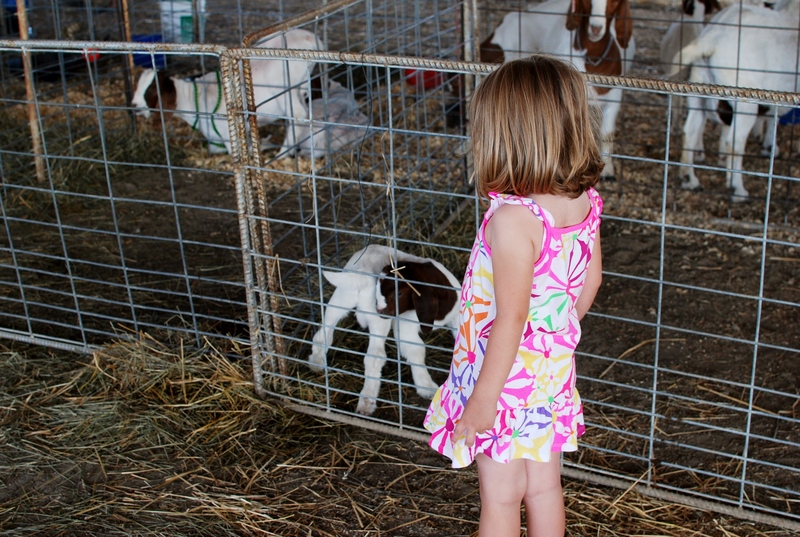 We found out about the “Clover” program which judges showmanship of the kids rather than the characteristics of the animals. Its for kids 8 and under, so that will be perfect for us! 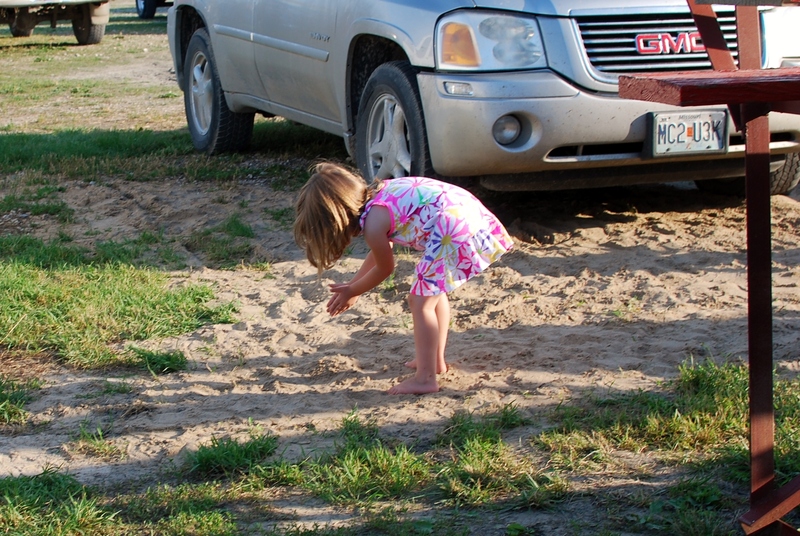 Although they spent most of their time playing in a pile of sand behind the bleachers, Brett and Anna also watched a few classes go through the judging process. 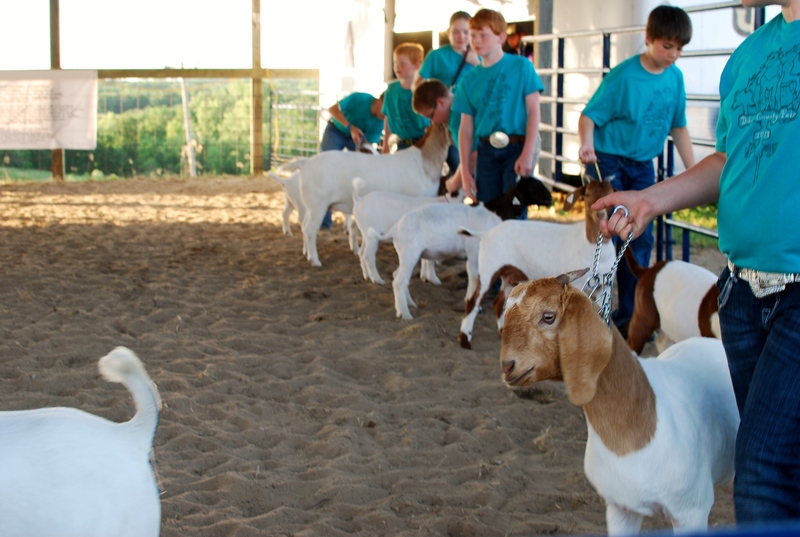 Brett is all excited about teaching our goats how to stand properly for a judge. He wants to start tomorrow. I’m counting on YouTube to come through for me on this. Feel free to leave advise in the comments!! 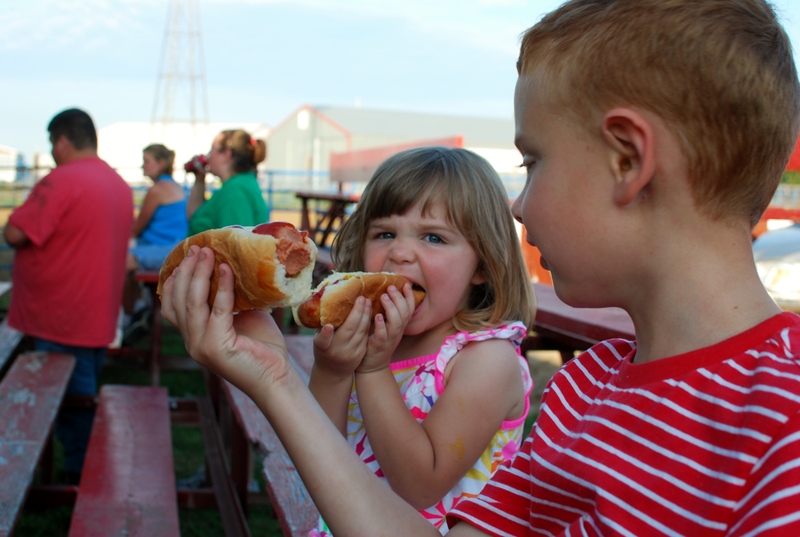 Then we ate jumbo hot dogs (fair requirement I’m pretty sure) and played in the sand some more before coming home to leave a massive ring in the bathtub. This farm life really grows on you. Whew! What a great weekend! 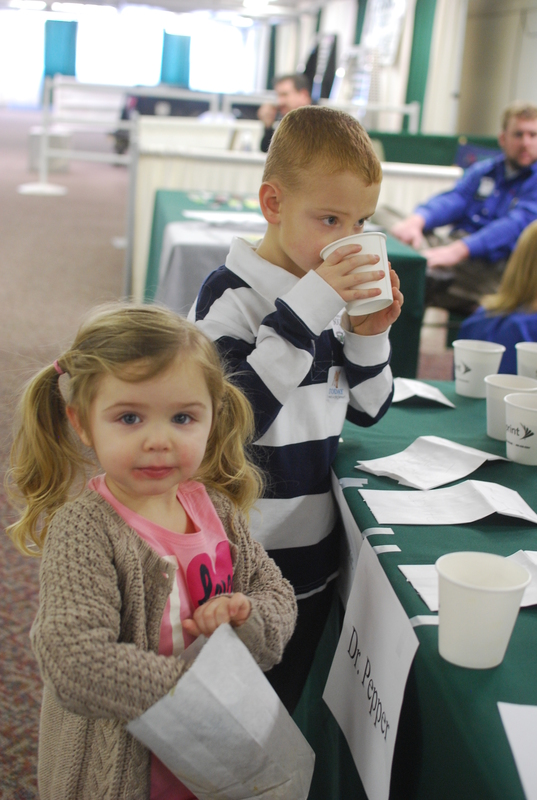 We just got back from one of our favorite farm family events, the Missouri Farm Bureau Young Farm and Rancher conference. Its held in south Missouri at a resort on the Lake of the Ozarks, with classes for mom and dad, pool and activities for the kids, AND… moving stairs. Or electric stairs. Call them what you’d like, just as long as you let the kids go up them. And down them. And up them. And down them… It was the highlight of their week. Maybe their year. For the last few years Brian and I have served on the committee in charge of putting the conference together. But we retired from that position in December and this year we just got to ENJOY! It was lots of fun, especially the part about going up the escalator attending with our close friends! 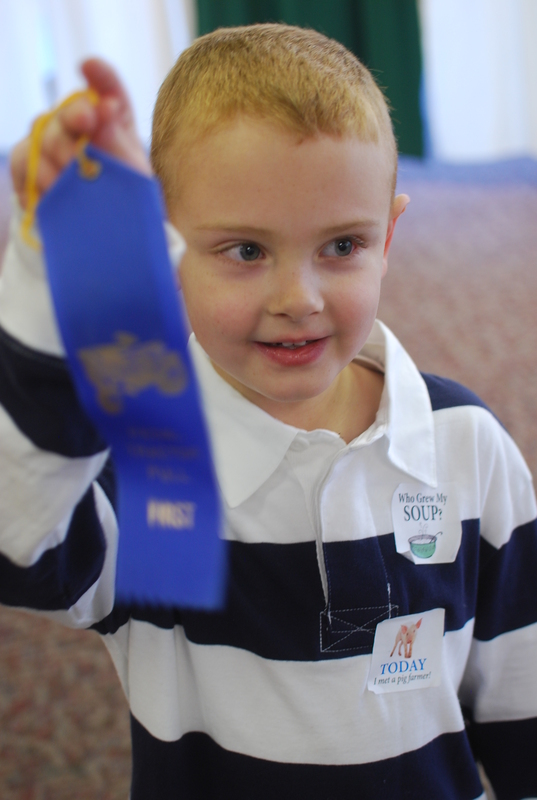 We came home with too many great ideas, bit of popcorn in with the dirty laundry, and even a 1st place ribbon from the children’s tractor pull! 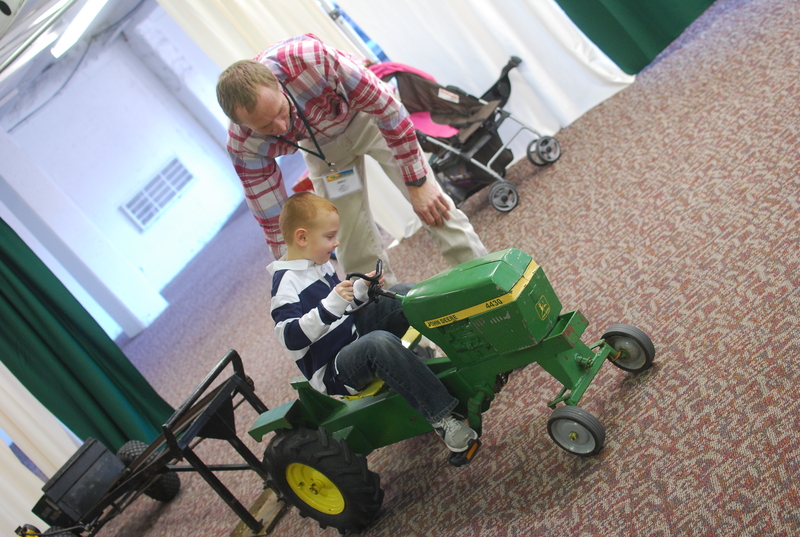 He worked really hard and didn’t give up, even though he didn’t understand why the tractor was so hard to pedal. Brett wasn’t alone in this confusion. 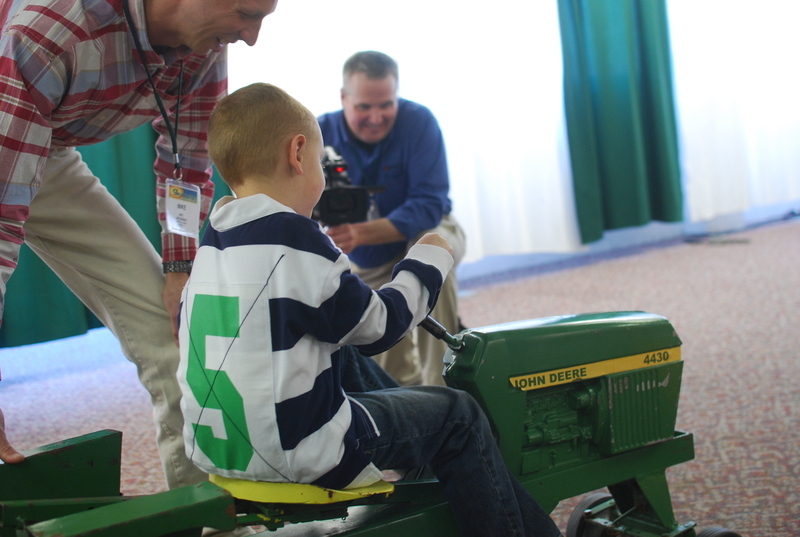 My favorite moment (maybe of the entire weekend) was a little boy in the four year old division who grew frustrated and complained loudly that the John Deere tractor wasn’t working right. 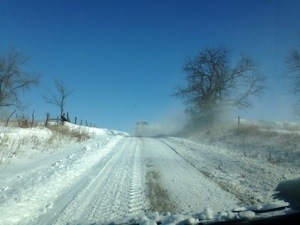 They needed to go home and get his International tractor, which worked much better! Go Big Red! 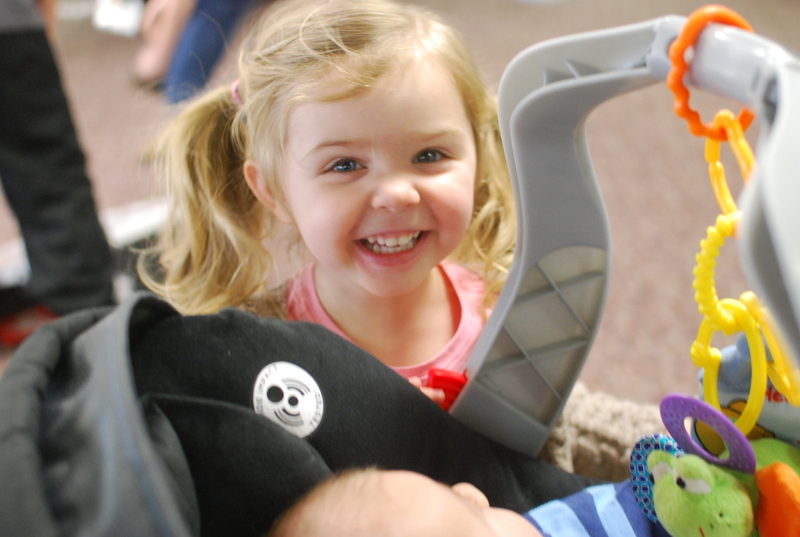 And just to even things out a bit, here’s Anna viewing one of the many babies who attended the conference. Babies are almost as much fun as escalators. I hope to go through our stuff today and prepare a post with the lessons and activities the Promotion and Education department did with the kiddos. Brett had a blast, so you know it was great stuff! Coming soon! In other news, our baby chicks should arrive this week. They ship Wednesday, so I’m hoping Thursday but certainly by Friday anyhow. I’ll be posting pics as soon as I get them settled. Love this part!! I love feeding my family wholesome, fresh foods. Of course, boxed macaroni is still one of my kids favorite treats. If I can just balance it with meals such as from-the-garden stir-fry, well, the occasional Girl Scout cookie isn’t the end of the world. But gardening was always so time intensive! I would start with great intentions, but inevitably the whole garden plot would end in ruins by the middle of July. And then, quite by accident, I learned gardening with a busy family can actually be simpler than I had ever dreamed! It all started with decorative raised beds I spotted online. 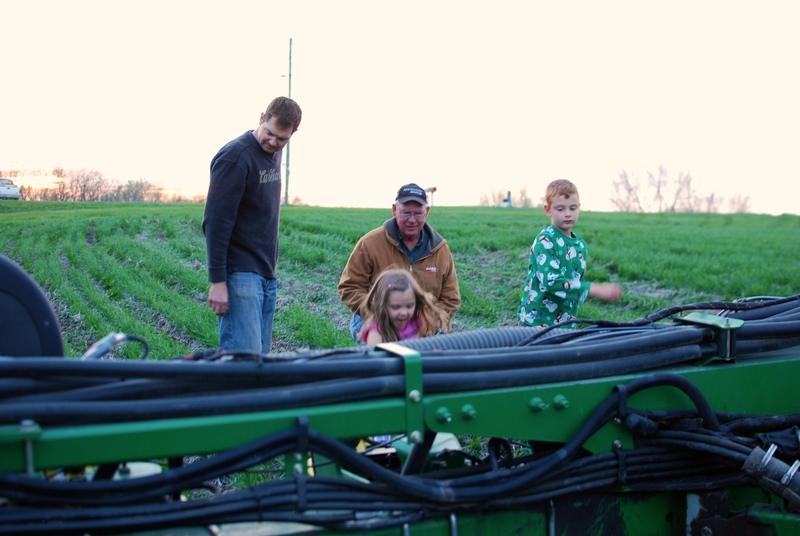 Spring time is a farmer’s busiest time of year, so I knew better than to ask Daddy to stop putting on fertilizer or planting corn to build me garden boxes. So I printed off the plans, drove to Lowes, and built my own raised beds. They were FANTASTIC! I actually harvested something more than zucchini for almost the first time ever. The next year my mom gave me The Square Foot Gardener for Christmas and I was hooked. I build more beds, tried new plants, canned lots for later. And I realized I’d gone from gardening because I wanted the end product to gardening because I loved the process. Instead of fighting weeds I was growing food! Use raised beds! 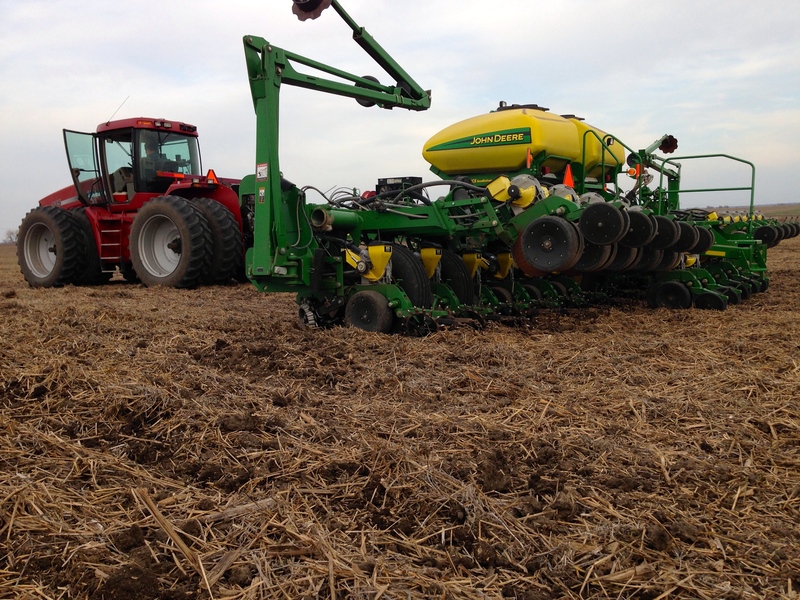 Planting in rows is what my husband does with a tractor. I am not doing that much work by hand! Buy seedlings from a greenhouse. As a beginner starting with seeds that can be sown into the raised beds after last frost or buying plants can be the difference between success and burnout. Plant what your family already eats. Okay, if you find something you just have to try, sure, have fun. But don’t plant a bunch of kale or broccoli in your garden if you’ve never cooked with them. I grew eggplant two summers in a row before I realized all my beautiful purple veggies molded in the fridge ’cause I had no idea what to do with them! Plant the amount your family will eat. Two vines of acorn squash is more than enough for my family. Even if they store well. Even if the plants are cheaper than squash from the store. Even if I like sausage stuffed acorn squash. We just don’t need a whole row. 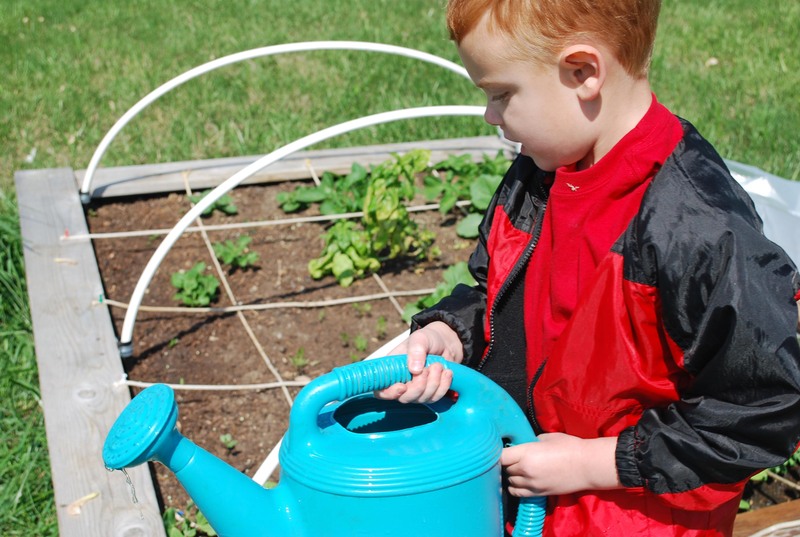 Place your garden beds near a water source. If you have to stretch a hose over the driveway and so must wind it each morning you will NOT water your garden daily. Rain barrels are on my list for this spring. I’ll keep you up to date on how those work out for me! Place your beds where you notice them. Out of sight means out of mind. Involve your kids. Maybe not every day, but their fresh perspective keeps you fresh as well. Error on the side of smaller. You can always get more sweet corn from a pickup on the side of the road. Don’t overwhelm yourself. Do small the first year and add more next year. 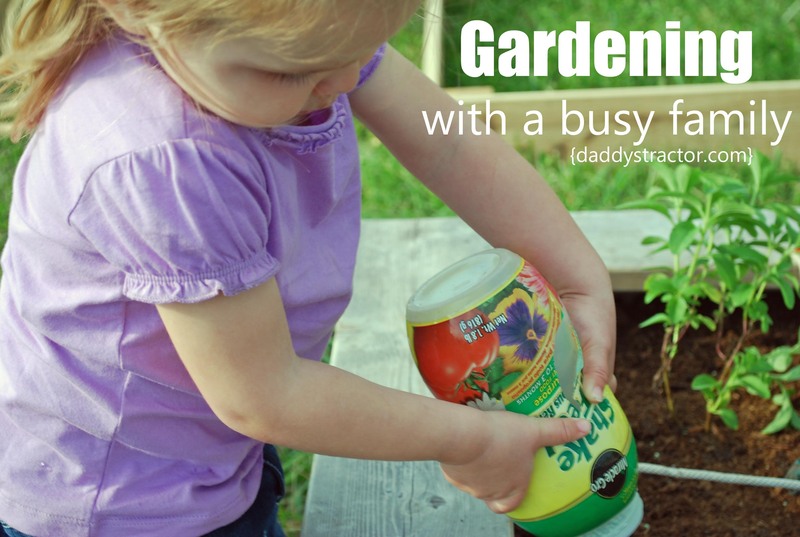 And there you have it– everything I’ve learned about gardening with a busy family! What’s your best tip?